Bergen is the second largest city in Norway and the most popular gateway to the fjords of West Norway. The city is renowned for its beautiful nature and offers excellent hiking opportunities in its immediate surroundings. Having fostered many of Norway’s greatest bands and artists, the city is also famous for its cultural life and underground/indie music scene. 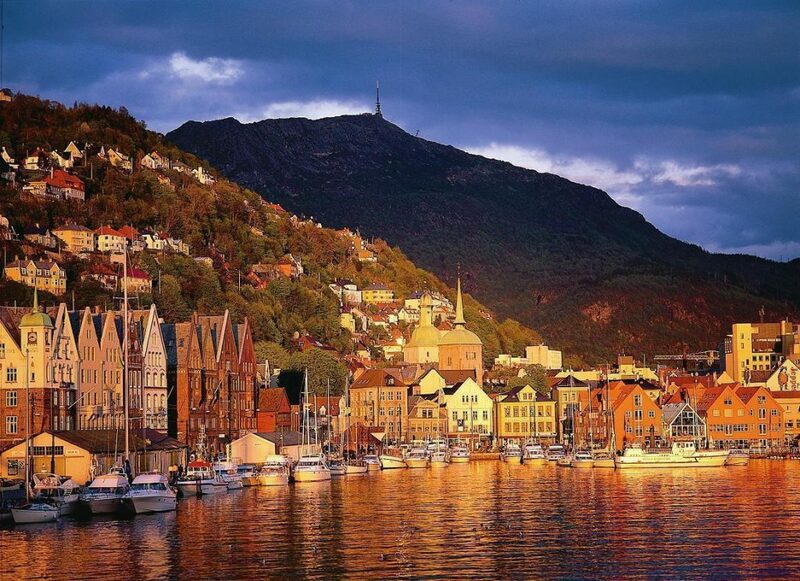 Founded around 1070 AD, Bergen quickly evolved into one of the most important cities in Norway. It was the country’s administrative capital from the early 1200s until 1299, and the largest city in Scandinavia. 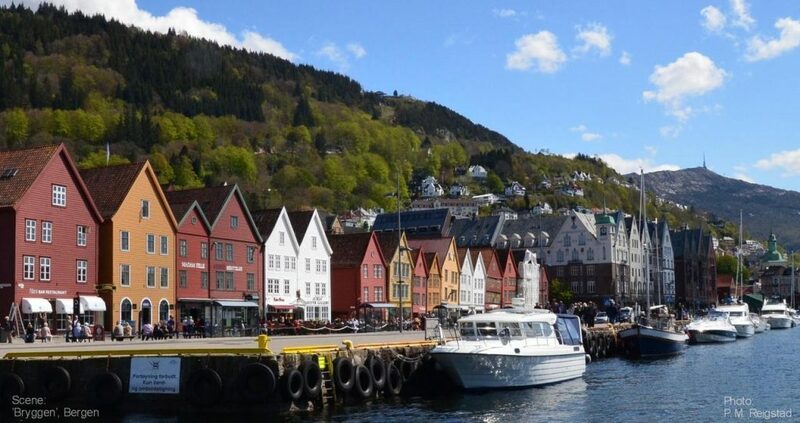 Bergen was one of the most important bureau cities of the Hanseatic League, interconnecting continental Europe with the northern and coastal parts of Norway, thus becoming a central spot for the vending of stockfish and the commercial hot spot in Norway. It was the largest city in Norway until the 1830’s and has a long maritime history in shipping and finance. The city still has relics of its Hanseatic heyday, most notably the old harbor of Bryggen, a UNESCO World Heritage Site. Bergen has been ravaged by several fires; the most recent major fire took place in 1916, a fire which destroyed most of the buildings in what is today the central parts of the city center, centered around the large square Torgallmenningen. Bergen is located far west in Norway, sheltered from the North Sea only by a number of islands. It is situated along latitude 60 degrees north, as Oslo, Stockholm, Helsinki, Saint Petersburg and Anchorage. The city is the most hilly and mountainous in Norway. The city center is surrounded by a group of mountains and peaks known as the Seven Mountains, a defining characteristic which has given the city its name (berg is an old Norse word for mountain). The geographic conditions of the city are very visible; limited space to build on made it necessary in the 19th century that new city blocks be built on the steep slopes of mount Fløyen. Except for the dense city center, which made up the entire city before 1916, Bergen is the least dense of the four largest cities in Norway. Most of the settlement inside the very wide city borders is concentrated in the western part of the municipality. The rest of the municipality is made up of mountains, as well as some farmland and smaller settlements. Due to the city’s location relatively far north, close to the northern sea and surrounded by mountains, special weather conditions occur, resulting in approximately 240 days with precipitation a year and a mean temperature of 7.6 °C (45.7 °F). In January 2007, a record of 85 rainy days in a row, was set. Still, local people claim there is no such thing as bad weather, only bad clothing. For the rest of us, the trick is obviously to choose the time of visit with caution. If you’re lucky enough to catch the city on a sunny day, you will find an incredible atmosphere as citizens really know how to appreciate nice weather. City planners have probably had this in mind the latest years, resulting in open spaces, parks, flowers and lawns scattered all over downtown. July has the highest mean temperature, 14.3 °C (57.7 °F), with August, 14.1 °C (57.4 °F) following close behind. May is usually the month with the least precipitation. 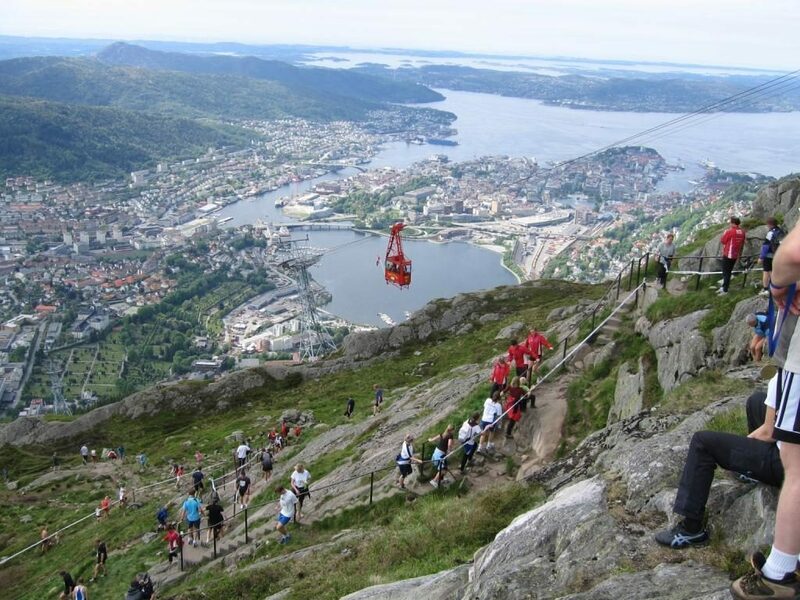 Considering the number of local events this month, May is probably the best time to visit Bergen, with the summer months of June, July and August as an almost as good second choice. Bergen is one of the most important cultural centers in Norway. The city is the home of the Bergen International Festival, Nattjazz and Bergenfest, festivals of international renown within their genres. The local symphony orchestra, Bergen Philharmonic Orchestra, was founded in 1786. It is one of the world’s oldest orchestral institutions. Bergen was the home of Norway’s great composer, Edvard Grieg. Henrik Ibsen, the famous playwright, started his career in Bergen as manager of Den Nationale Scene. Around 2000, a number of artists from the rhythmic music scene in Bergen gained international fame. In the domestic press, this became known as the Bergen Wave. Musicians and bands with roots in Bergen include Annie, Burzum, Enslaved, Gorgoroth, Immortal, Erlend Øye, Kings of Convenience, Röyksopp, Sondre Lerche, and Datarock. Bergen still has a thriving underground/indie music scene. In recent years, a number of great international artists have visited Bergen, including Bob Dylan, The Rolling Stones, Metallica, Iron Maiden, Foo Fighters, Coldplay, Muse, Bruce Springsteen, Depeche Mode, Kent and Mark Knopfler. And in the summer of 2011 several artists including Roxette, Mastodon, Avenged Sevenfold, Suzanne Vega, Bob Dylan, Kaizers Orchestra, Kanye West and Rihanna appeared.